Philae Lander's Final Resting Place Located On Comet : The Two-Way The lander was the first to ever set down on a comet — but couldn't get enough sunlight to recharge its batteries, and went into hibernation. New images show Philae stuck in a crack. Photos taken on Friday, from more than a mile and a half from the comet, show Philae's three-foot-wide body and two of its three legs. The April 2015 image on the top right shows the comet overall, with the approximate location of Philae marked with a red dot. The famous little probe — the first one to ever land on a comet — has been silent for more than a year, after a less-than-perfect landing left it struggling to get enough sunlight to recharge its batteries. And now — thanks to a high-resolution photo — we finally know where it is. The lander, carried by the Rosetta spacecraft on a European Space Agency mission, had been eagerly watched from Earth throughout its mission. A few successful hours of communication were celebrated, and then it was clear they couldn't last. The ESA marked the lander's descent into "eternal hibernation" with mournful tweets — "it's cold and dark," the Philae2014 account said. "It's time for me to say goodbye." The problem, as NPR's Nell Greenfieldboyce tells our Newscast unit, was that Philae hadn't ended up where it was supposed to. And as a result, no one knew exactly where it was. "Instead of landing on a flat spot as planned, it bounced and flew for another two hours, ending up ... somewhere," she says. "Controllers could talk to it, but its exact whereabouts remained unknown." Before it shut down, Philae did send photos showing its landing spot. But the gray rocky scene it showed was, well, less than distinctive. But now, with just one month left on its mission, the Rosetta spacecraft flew near the comet and caught a glimpse of the lander's predicament. It's now clear why the lander had so much trouble recharging and communicating: It turns out the washing-machine-sized lander is wedged in a shadowy crack. The high-resolution photo shows about 5 cm per pixel. 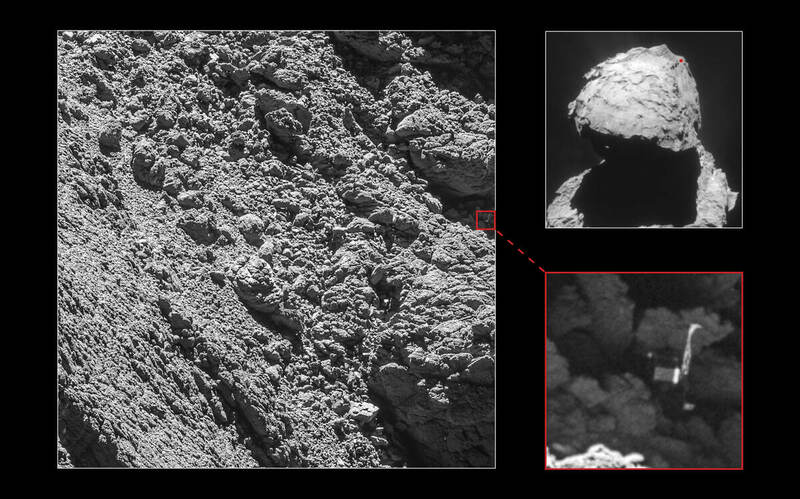 That's enough for scientists to be able to discern a number of Philae's features. 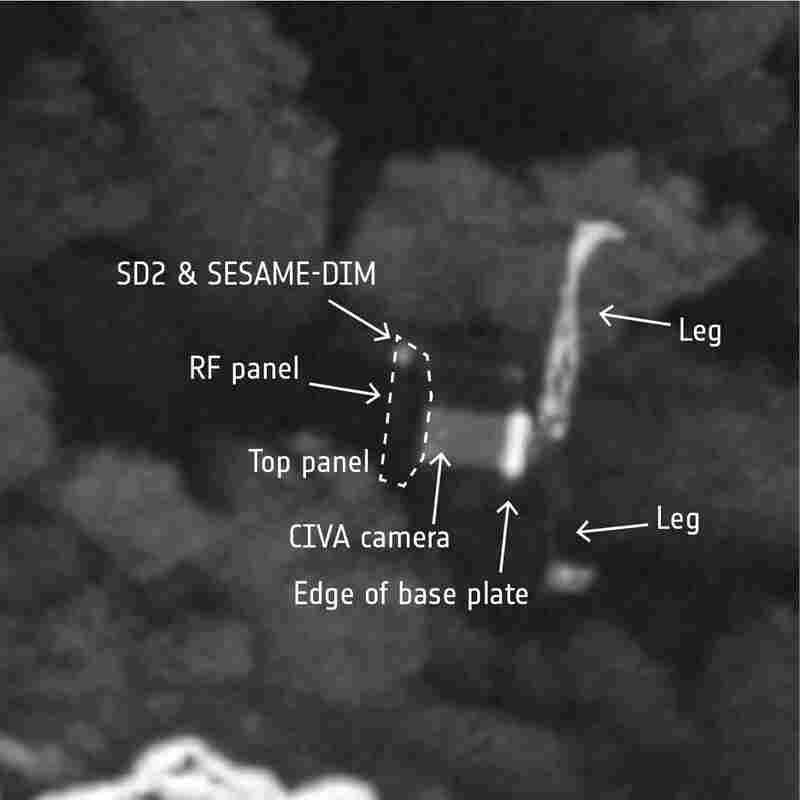 The photos from Rosetta, taken "unprecedentedly close" to the comet, show the main body of the lander and two of its three legs, ESA says in a blog post. "This remarkable discovery comes at the end of a long, painstaking search," Patrick Martin, ESA's Rosetta Mission Manager, says in the post. "We were beginning to think that Philae would remain lost forever. It is incredible we have captured this at the final hour." On Sept. 30, Rosetta will take an even closer look at the comet — by crash-landing on it. Spacecraft and lander will be together again, each quiet and still, on the surface of Comet 67P.